Planning a wedding can be one of the most exciting times in a woman’s life. The wedding itself is sometimes anticlimactic. After the wedding, it mostly comes down to paying bills generated by the wedding. But planning the wedding itself is almost always exciting. If the traditional ‘White’ wedding is getting a bit played out for you, fear not. There are many ways to keep things fresh and new. For a different spin that will provide plenty of challenge, why not try honoring your heritage with a culturally relevant wedding? I recognize the fact that it is very possible your heritage might well be best represented by a traditional white wedding with a dress from Essense Designs as a centerpiece. In which case, honor that tradition. And wear the best dress the royal court can afford. But as traditions go, the white wedding isn’t really all that old. White didn’t really come into fashion until 1840s with the wedding of Queen Victoria. Your personal historical trek does not necessarily take you through Queen Victoria’s court. Prior to white, the colors such as pink, purple, red, and blue ruled the day. Asian is one of the oldest cultures on this Earth. Much of the world, including America, owes a lot of their cultural heritage to China. Much of America was built on the backs of Asian laborers. And people of Asian descent make up a good portion of the American population. That means we should be seeing a lot more Asian wedding dresses than we do. Traditional Japanese wedding dresses come in multiple pieces. There is a white component called shiromuku, meaning white kimono. After a semi-private ceremony is the reception for friends and family, This is where the colorful wedding clothes make an appearance. This type of wedding involves two or three dresses. That’s more like it. The Aztecs, Mayans, and other indigenous women of ancient Mexico wore brightly colored skirts and blouses made of cotton or cactus-based textiles. You can still see traditional colors and fabrics in current Mexican clothing styles, with their bright embroidery, use of color, knotted details, and use of natural, cool fabrics. These dresses are not designed to break the bank, but to be extremely festive. That is a wedding tradition that makes a lot of sense. And you don’t have to be of Mexican heritage to honor that particular tradition. In India, white is the new red. For a number of reasons, white is starting to encroach on the traditional red wedding dresses of India. For many cultures, white represents mourning. As in other parts of Asia, red represents good luck and happiness. 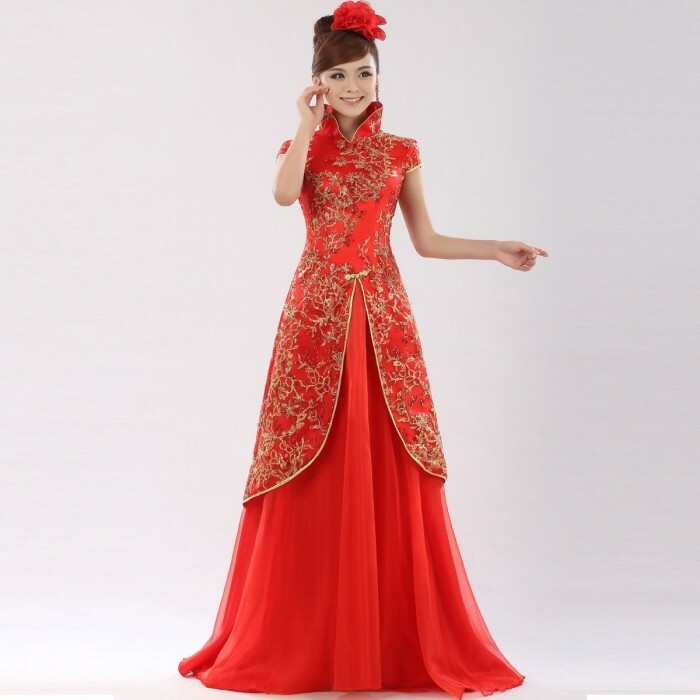 The dress material is usually something that reflects light well, such as silk, satin, or chiffon. We could spend all day sifting through traditional wedding dresses from around the world and it would never get old. The world is bigger than one accidental 175 year-old wedding. Perhaps our thinking about wedding dresses should expand accordingly. Suggest some sunflower bouquets for summer wedding. Which is the best curly wedding hairstyle? How can one dry wedding corsages?